Fluids – Have all fluids checked and replaced if necessary. Don’t forget the oil, coolant, brake fluid, windshield fluid and gasoline. Yes, gasoline. Keep your tank full to prevent moisture from freezing in the lines. Also, when unexpected weather hits and you are delayed in traffic, you won’t have to worry about running on empty. Wiper Blades – Weather ages blades quickly and they tear easily in freezing temperatures, so start out the season with new ones. 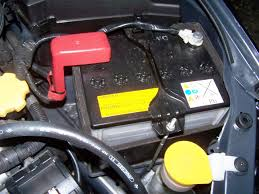 Battery – Cold weather reduces the cranking amperage of the battery. Have it tested, serviced and replaced if more than 4 years old. Tires – Of course cold sloppy freezing weather brings traction problems so check those tire treads and replace tires if necessary. The cold can also reduce the pressure so check often for proper inflation and don’t forget the spare. Floor Mats – Tracking snow and salt into your car’s interior can ruin carpeting so make sure you have some good all-weather mats in place. Emergency Kit – Items you may want to include are flares, boots, gloves, shovel, blanket, ice scraper, flashlight, rock salt or kitty litter for traction. Also have emergency numbers and insurance information handy and maybe some spare change, just in case. When it comes to choosing the best lighting for your garage it all comes down to your personal preferences and how you plan to use your garage. Whether you’re building a new house with an attached or detached garage or just upgrading the one you have, your choice of lighting will influence how usable your will be and how much time you’ll spend working in it. These three easy steps will help you select the right lighting for your garage. Consider how you plan to use your garage. Will you only be parking the family cars inside? Do you need a workshop or hobby area? Will the garage be sued for storage? Will you be parking the cars inside and storing the riding mower, the recycling bins and an ATV? Select general purpose lighting to illuminate all sections and the corners of your garage. Fluorescent light fixtures are a popular choice. They provide more than adequate general lighting and fairly common for use as general purpose lighting. Furthermore, they can be equally spaced across the span of your garage for the best illumination. If you have questions, about fluorescent lighting, check with your electrician and/or lighting professional. Consider the layout of your garage or workshop and create individual work stations or storage spaces within it. Choose task lighting for each specific purpose or designated space. Consider positioning an overhead light above a craft table. Select incandescent lighting options for closets and other small storage spaces. If you plan to have a workbench, choose track lighting or a fixture that fits neatly under an overhead cabinet to light up the work surface. Finally, purchase a drop light or trouble to illuminate dark and obscure spaces, such as under the hood of a car. 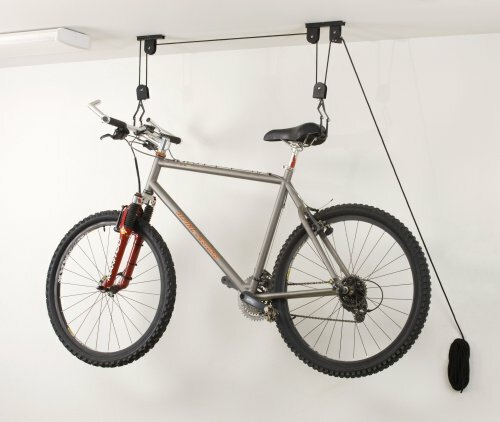 A drop light is portable and can be use for all kinds of purposes within your garage and home. After you’ve selected the lighting fixtures you need, hire a licensed electrician to install them according to local building and electrical codes. Is your garage a piled mess of items you need to store but don’t have a designated space for them? Do you wish you could one day park the car in the garage again? If so, it is time to organize your garage. The best way to do this is to clean out the entire garage and install storage cabinets and other accessories to help you stay organized. Once you clean out the garage, sort items into two piles – the items you want to keep and the items you no longer need. Now determine if the things you are getting rid of can be recycled, donated or just thrown away. Next take a look at your “keep” pile. Assess how much storage space you’ll need and what types of storage accessories will best accommodate your belongings. 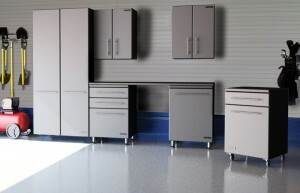 Garage storage cabinets are available in a wide variety of choices so it should be easy to find just the right ones to fit in your garage and accommodate all of your belongings. In addition to cabinets, there are other storage accessories available like shelving units, workbenches and counters that provide extra storage space and even work space. Install storage cabinets and shelves according to your needs. Be sure to consider locking cabinets for items that you need to keep out of reach of small children such as power tools or harmful chemicals like pesticides. Remember to give the kids some storage space, too. Floor cabinets and shelves at the bottom of the shelving unit are easy-to-access for children allowing them to have a place to story outdoor toys, skateboards and soccer balls. Do you need a workbench for small home repair projects or a lighted counter space for hobbies? Consider all the reasons you’ll use your garage and install all the proper garage furniture and storage accessories. Once cabinets, shelving units and other storage accessories are installed, store all your belongings in their designated spaces. Each time you use a particular item, return it to the place you got it from. This will help keep the garage floor clear and leave room for you to park the family car. The House Plan Shop hopes you’ll have a tidy garage in no time. For more information about getting organized, check out our home organization blogs. The primary function of a garage is to store and protect automobiles. An enclosed structure such as a garage can protect the family cars from the elements preventing hail or sun damage. It will also protect your vehicles from falling tree limbs and other debris during thunderstorms. And who wants to scrape frost, ice and sleet of their windows every morning before work throughout the winter months? Don’t forget to consider auto protection from a safety stand point. When your car is parked safely in a locked garage, there is less chance of auto theft or property damage than when it is parked on the driveway on in the street. Sometimes, building a garage adds a special workspace in the form of a workshop or a hobby room you might not have space for in your attached garage or in your home. Some garage plans include special spaces like a workshop or craft room in addition to parking bays giving the garage another function in addition to auto storage. Other times, an entire garage can serve as a workshop or a place for hobbies and wood crafts. Garage plans with loft space sometimes allow for the upper level to be finished a usable space such as a home office or sewing room. 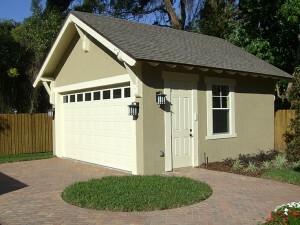 Many people build detached garages to add extra storage space to their homes. In the instance of a 3-car garage, perhaps just two bays are used for parking. The third bay could be used to stash boxes and attic overflow or for storage of the family bikes, outdoor sporting equipment or even the riding mower and other lawn and garden tools. A garage loft plan might offer attic storage for seasonal items like holiday decorations. Other home owners might build a detached garage plan to store motorized items, like ATVS, motorcycles or a golf cart, that do not fit in their attached garages. Storage possibilities are endless with detached garage floor plans. Don’t forget about the added value a new detached garage will contribute to your home. When you add a practical and useful structure, such as a garage, to your backyard, it will increase the value of your home. Should you ever have to sell your house, you’ll see a nice return on your investment. It is easy to see why adding a garage to your home or property will improve its overall function while satisfying your needs for parking, workspace, storage, and value. Furthermore, detached garages are available in a wide range of sizes and architectural styles, ensuring you find the right one to fit on your property and match your home.